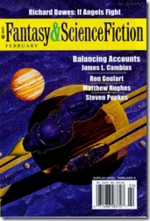 current (February '08) issue of The Magazine of Fantasy and Science Fiction. Actually, it's the cover story. John Joseph Adams interviewed Jim about it, and it's been getting a good reception from readers. Check it out if you get the chance! We've warned you and warned you about Giant Rocks From Space. Well, now you can see one for yourself. Asteroid 2007 TU24 is coming. It's due to pass the Earth tonight at 3:33 a.m. Eastern time, swinging to within 1.4 times the distance of the Moon, or about 334,000 miles. 2007 TU24 is on the small side for an asteroid, a mere 250 meters across. Nevertheless, you would not want to be nearby if it did manage to strike the Earth. You can see blurry radar images of it here. Or you can go to the asteroid's home page for some crackpot weirdness about electromagnetic storms and general catastrophes. When that palls, check out Phil Plait tearing the crackpots some new ones at his Bad Astronomy site. Better yet, you can stay up late and watch it yourself. It will move through the Northern sky, passing through Perseus, Cameleopardis, and Ursa Major. Here's a map generated by JPL showing its position as seen from Philadelphia, and here's an online ephemeris generator to get more detailed position information. You'll need a pretty good telescope to see it, though. 2007 TU24 is small and made of darkish stuff, so it's not going to be brighter than 10th magnitude. Anything with a lens 3 inches across or wider should be able to detect it. Don't forget to wear proper protective gear, though. This little guy is Cimex lectularius, the common bed bug. They’re small, bloodsucking insects that hide in tiny crevices in homes by day, and come out at night to prey on sleeping humans. 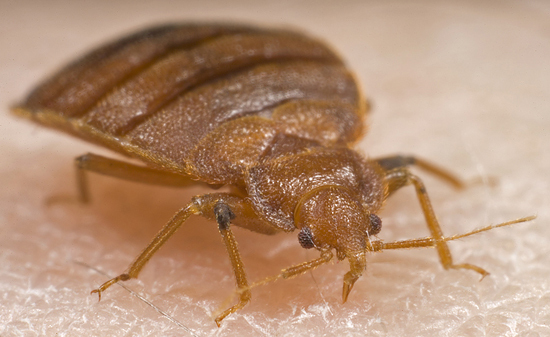 Any one bed bug doesn’t eat very much —only one meal a week, on average. But they breed like crazy: mature females can lay five new eggs each day over their four-month lifetime, so before you even know they’re there, a couple of bugs can turn into a large infestation. Photo from Environmental Health and Safety, Harvard University. Food contains a lot of energy. Sometimes it's instructive to think about just how much energy is represented by what we eat. Consider, if you will, the Oreo Rocket. It's powered by Oreo cookie filling and an oxidizer. There are other rockets powered by sugar, and of course nowadays we're hearing about the use of biofuels for all kinds of applications. I think it's instructive to do the math: a 12-ounce can of Coke contains 155 calories. Of course, when we talk about food, that's really kilocalories. A kilocalorie is equal to about 4.2 kilojoules, so that Coke packs a walloping 650 kilojoules of energy. How much energy is that? It's enough to accelerate that can of Coke to a velocity of almost 2 kilometers per second, or roughly Mach 7. So why can't I chug down a can of Coke and then throw the rest of the six-pack at hypersonic speeds? I've got the energy, right? Well, it's a sad fact that human bodies are pretty inefficient. At best we manage about 25 percent efficiency, and we can't store a lot of energy for very rapid release. This has an interesting implication for biofuels: it's actually a more efficient use of energy to burn food than to eat it. That's good news if you're lazy and prefer to let machines do the hard work. But it's bad news if you're hungry . . .
A tip of the hat to the commentors on this post at Transterrestrial Musings. Here's what all the cool kids are going to be wearing in 2020: printed circuit contact lenses. Why? Well, of course they look all cyborgy and cool, but they can also be used to put a display screen right up against your eyeball where nobody else can watch it. There's plenty of legitimate applications -- helping the disabled control things via a computer interface, military targeting devices, wicked cool video games, etc. But it's hard to avoid the thought that the majority of contact-screens will be used for playing games or surfing naughty Web sites when the wearers are supposed to be paying attention to something else. Anyway, there's a neat picture of a bunny with creepy cyborg eyes at the other end of the link. Parasites really can be insidious. A parasitic nematode called Myrmeconema neotropicum infects ants, making their bodies swell up to resemble ripe berries -- just the kind of berries birds like to eat. The ants get snapped up, and the nematodes find a new home in the bird's gut. Mimicry is pretty common in the natural world. We're all familiar with creatures like stick insects, which resemble other things in order to avoid getting eaten. But the Myrmeconema nematode turns that on its head -- it makes its host more likely to be eaten. So if you find yourself looking like a large berry, see if you have nematodes. Here's a very cool video about undersea organisms by deep ocean explorer David Gallo. (A tip of the squid hat to David Thompson for the link.) The creatures he shows are really lovely -- and as anyone who's seen luminescent jellyfish at an aquarium or while diving knows, they're much prettier when seen with the naked eye. The Gallo talk is part of a whole series of videos available at the TED Web site. All of them are interesting, and some are really excellent. There's a giant cloud of hydrogen gas speeding toward our Galaxy. It will hit in less than 40 million years! This means you have a little time to start making your gas-cloud-impact plans, but it's never too soon to start. What's likely to happen when it does arrive? A wave of new star formation -- lots of new, bright, massive stars forming and then blowing themselves to smithereens in supernova explosions only a few million years later. The whole region of the Milky Way Galaxy is likely to become uninhabitable as the supernovae flood it with energetic radiation. Really, there's nothing to do but move to the other side of the Galaxy and wait for the storm to pass. That may take some time -- the Milky Way is about 100,000 light-years across, and the central region is probably uninhabitable. The fastest object launched by humans is only going a piddly 20 kilometers per second, or 1/15,000 the speed of light. That means that if we started right now it would take 1,500,000,000 years to reach safety. That's more time than we have. Going at interplanetary speeds we'd still be in the danger zone when the cloud hits. Time to start working on better rockets. Researchers at JPL have downgraded the threat to Mars from the asteroid 2007 WD5, and it seems more and more likely that the object will miss the Red Planet this time around. The odds of an impact are now about 1 in 10,000 down from the excitingly scary 1 in 25 figure bandied about earlier this month.